Verb Media Inc was a motion-centric branding and identity firm focused on entertainment, advertising, and corporate communication for television networks, ad agencies, and production companies. In 2001 they moved from a window-less small office to a large light-filled space on the corner of West Broadway and Canal Street. 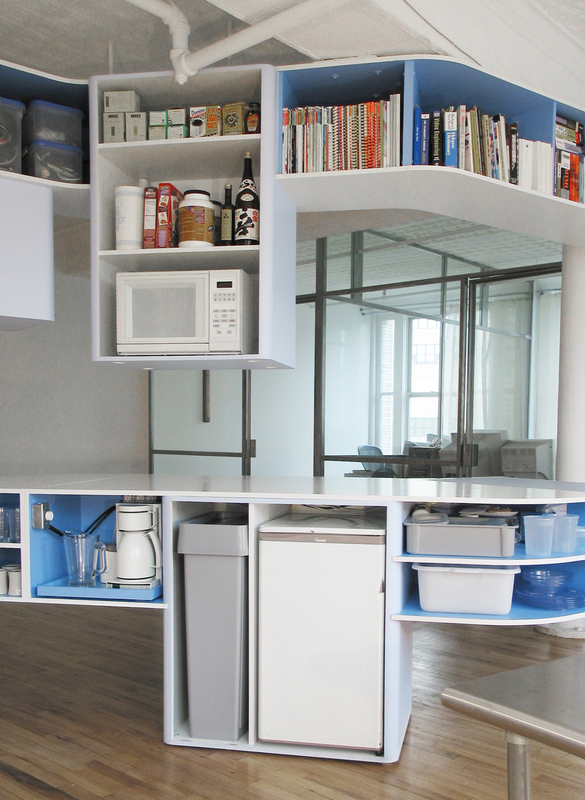 The design consists of three parts: private offices, a storage cabinet, and moveable room enclosures. The serpentine cabinet leads visitors from the entry reception area to the conference room. It forms a physical divide between the public waiting area and the work desk area. The storage cabinet houses the shared devices and reference materials of the office, placing them in the most accessible location in the space: the center. It has engulfed the water cooler, coat closet, printers, cutting mats, stationary, microwave, refrigerator, coffee maker, video library and display monitors. Curtains delineate a conference room and an edit room. The quilted fabric muffles sound and blocks light during presentations. When not in use, the curtains can be pushed aside to open up the space.